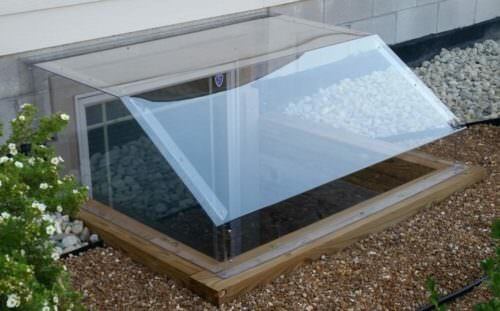 Our Atrium Dome clear window well covers are designed to cover your window above the top of your window well. We make these covers to your specific needs. Many customers prefer this cover just for the good looks of it! These covers are designed to accommodate casement/crank-out style windows that need a special cover because the low profile style covers prevent the window from opening out into the well for emergency escape. 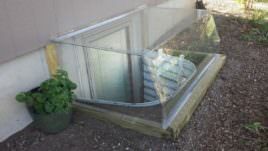 These clear window well covers are custom designed to fit any width, projection, and height. If you have a crank-out or casement window, this dome is designed for you. Another advantage to this cover is the unobstructed view–on most covers there is no bracing in your line of sight. The polycarbonate plastic is strong enough to withstand an adult falling on the cover without falling through. We have made these covers with mesh fronts and sides to allow for ventilation for air conditioning units and other machinery. We have a cover to suit any need. 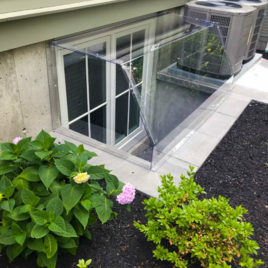 Please contact us seven days a week for assistance or to learn more about our Atrium clear window well covers or call 1-888-650-WELL (9355). We still have some tidying up to do with cable and phone lines but the cover looks great and durable. A big thanks to the production team. Wisconsin rocks! Perfect! Thanks for all your help, Window Well Experts. I could not have imagined how good the atrium dome will look in my garden. Service was wonderful... product was outstanding. That new cover you manufactured for our unique window situation is excellent. With my casement/crank-out windows I wasn’t sure how in the world we would find a cover to keep the snow out and still be able for my son to use the emergency egress window. It really looks good, too. Thank you so much. Thank you very much the atrium domes are perfect. Here in the NE we have been battered by lots of rain and snow, and I have not had a problem with the covers. 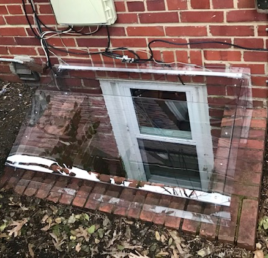 I did some research on the internet for our new basement window well and realized that a Home Depot cover was not going to be sufficient for our window size. The winters on Long Island have become long with many inches sometimes many feet of snow that stay for long periods of time. Reading all the testimonials as well as the rave reviews on the good customer service from Window Well Experts we decided to go with them. From my first phone call I knew this was the company to go with. Kathy Faltinson and her team of experts answered my questions in a timely manner. 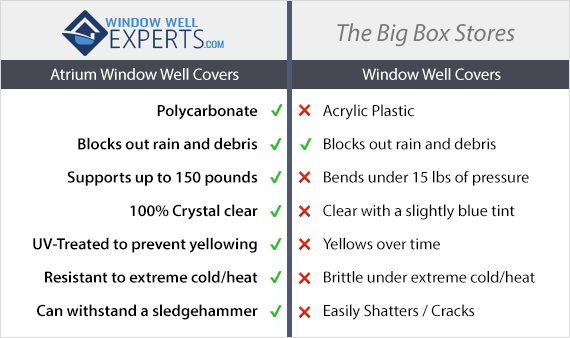 I highly recommend Window Well Experts for a high quality window well cover. WWE was very helpful and nice to work with. Great product custom fit to my well and works perfectly! No more worry of the dogs or kids falling in! Love, love, love our egress cover!! Attention to detail in planning was very much appreciated. Good fit and functional. This was a rather extensive project and WWE made it happen. The covers are large and very well made. Great product, the customer loves the cover and it looks very professional. a little on the expensive side but well worth it. Window Well Experts is the best way to go. They definitely try their best to meet your needs. They do incredible work. Service was wonderful…product was outstanding.